Although it’s not ideal to run on concrete, sometimes it is unavoidable. Or you may work on concrete floors and need a comfortable running shoe that will ease the discomfort you experience on a daily basis. Either way, being on your feet while walking or running can be not only painful – it can potentially cause injury if you aren’t wearing the proper footwear. Running shoes with extra support and tons of cushioning are your best bet to combat hard, unforgiving concrete surfaces. 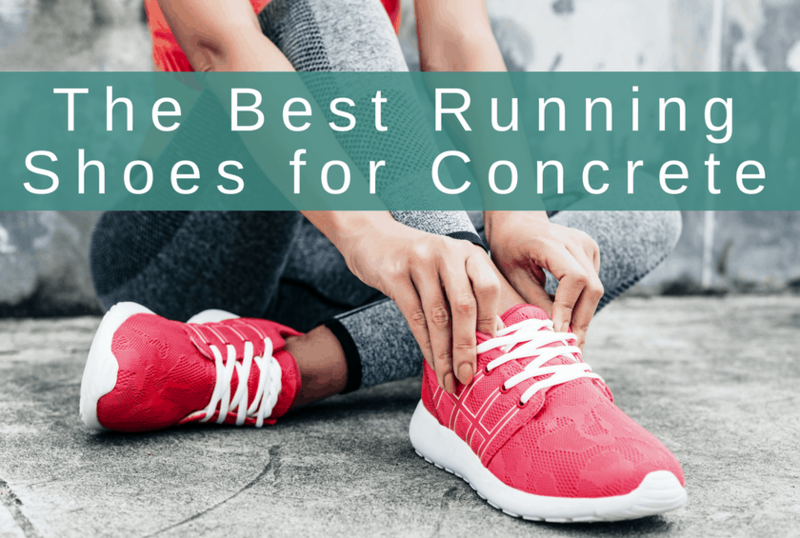 To help you in your search, we’ve listed and reviewed the best running shoes for running on concrete. All of these shoes features ample cushioning and great support. Plush and cushioned, with a smooth transition zone for an even ride, the Brooks Glycerin 17 helps protect you from the harshness of concrete. New to version 17 is a seamless upper that’s flexible and can accommodate wider feet. This flexible material extends all the way over the tongue and ankle collar. These are both heavily padded, yet responsive, with soft, breathable fabric and no heavy overlays. It does a nice job at keeping your feet secure while feeling great. Also new is an improved sock-liner. Sound boring? It’s not – this is what gives the Glycerin that soft and comfortable feel as soon as you put your feet in them. The heel cup is stable and sturdy and won’t let your heel lift. The 10mm drop will help cushion your landing no matter how you strike the ground. The midsole returns energy with pep and bounce, thanks to DNA Loft foam. This compound keeps the shoe soft and cushioned while providing energy return and durability. The signature design of the Glycerin 17 is the tread pattern on the outsole. Featuring Brooks’ Ideal Pressure Zones, it disperses impact during landings. The outer sole also provides good traction in a variety of conditions. The Bondi 6 is one of Hoka’s most cushioned shoes (and that’s really saying something), providing comfort and stability while protecting your feet against unforgiving terrain such as concrete. The Bondi 6 is relatively lightweight, weighing in at only 10 ounces, with an engineered mesh upper. This mesh gives the shoe incredible breathability, as well as ideal flexibility. A roomy toe box gives your toes plenty of room to spread out. From toe to heel, the Bondi 6 has EVA foam technology, which gives it the maximum cushioning we mentioned. The sole tapers at both the heel and toe, which provides a rocker effect and makes for great heel-to-toe transitions. Your foot also sits low in the shoe – so you don’t stand as high as it looks like you might. This effectively cradles your foot in the Bondi’s soft plushness. The wide base of the sole is designed to balance out the Bondi’s high stack height, and it does so admirably. High-abrasion rubber material covers most of the outsole, giving this shoe good grip and durability. The Saucony Triumph ISO 5 is a high-mileage trainer with plenty of cushioning, making it ideal for beginner and experienced runners alike. Even with all that cushioning, it’s a very light shoe that won’t weigh you down. Saucony has found an ideal balance between breathability and comfort, as there is plenty of ventilation to let your feet breathe. The real story is the ISOFIT lacing technology, which causes the upper to conform to the entire length of the runner’s foot and stay flexible throughout your run. It provides a comfortable, sock-like fit. The downside is there isn’t much lateral support. Saucony’s EVERUN foam runs the length of the sole, providing maximum cushioning. This responsive foam absorbs impact from concrete and other hard surfaces, and provides rebound to add bounce to your stride. It also maintains its cushioning longer than traditional EVA foam. The outsole has changed from previous models and now uses vertical rather than horizontal flex grooves. Unfortunately, this has somewhat lessened the grip of the Triumph, making it less than ideal for slippery surfaces. 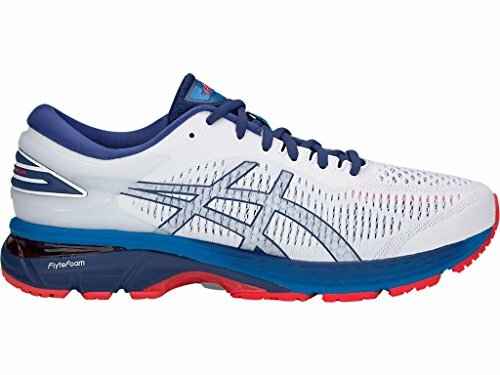 Stable yet incredibly soft and plush, the ASICS Gel-Kayano 25 has employed a large number of signature technologies to make this a dynamic long-distance running shoe. The soft cushioning makes it ideal for sidewalks and other concrete surfaces. The newly redesigned engineered mesh upper hugs the foot securely. FluidFit technology gives the upper flexibility and keeps it soft. The heel is held by ASICS’ Heel Clutching System, which is an external structure meant to stabilize and lock your heel into the back of the shoe. Meanwhile, the underfoot is kept cushioned using the Ortholite X-40 Sockliner. The FlyteFoam midsole gives the Kayano 25 a springy and cushioned ride – while staying relatively lightweight. Wedged into the midsole is ASICS’ traditional cushioning gel – the main source of the Kayano’s plush ride. The outsole uses ASICS High-Abrasion Rubber to provide reliable traction, while the Rear Foot Crash Pad ensure that the heel doesn’t take too much jarring impact. DuraSponge adds even more cushioning while reducing supination. And the I.G.S. (Impact Guidance System) helps guide the foot and smooth out the transition from heel to toe. With increased midsole rebound and a new mesh upper, the Clifton 5 has kept the comfortable cushioning of older models, while becoming even more durable. The Clifton is known industry-wide for its well-cushioned ride, and despite its light weight, the design contains plenty of cushioning to ease pain from running and walking on concrete. Made of a thin mesh with a few overlays, the upper of the Clifton 5 is comfortable, soft, and very breathable. The heel area hugs to your foot snugly, and the shoe widens towards the front. The toe box tapers in close to the toes, so those who need extra room in front may want to size up or try a wider size. The Clifton 5’s midsole is a single piece of CMEVA foam. It’s a bit firmer than older models, but still nice and soft. This soft, cushioned sole is where the Clifton really protects your feet from hard urban surfaces. The midsole is also rockered, with both the heel and toe angling upwards, making for a smooth ride. Despite this large midsole cushion, this shoe also has a great energy rebound. 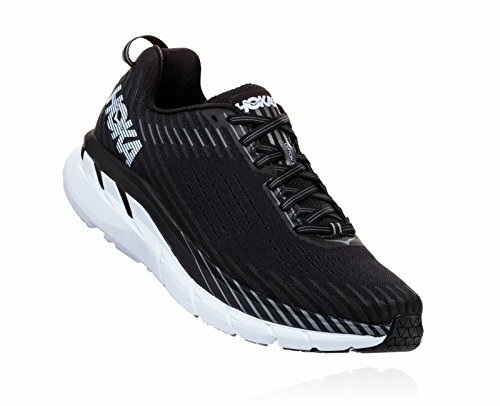 On the outsole, Hoka has added rubber to protect the midsole against wear, which was a common complaint in older models. This strip of rubber now covers almost the entire lateral side of the outsole, as this is commonly the side that makes the most ground contact. 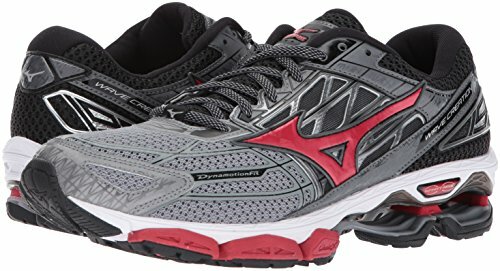 The Mizuno Wave Creation 19 is a comfortable and responsive trainer ideal for high-impact running on concrete. Extra cushioning has been added from previous models, as has a new sock liner that hugs the runner’s foot. The upper is constructed with breathable mesh to keep feet cool and dry. Dynamotion technology reduces the likelihood of distortion over time, making it a durable shoe. The interior comfort level has been improved with the addition of the sock liner. The midsole features several different densities of EVA foam for responsiveness and comfort. Extra cushioning along the bottom (called U4icX) runs the length of the shoe, making for a smooth ride. The outsole has high-density rubber traction at the heel and forefoot to hug the road, keeping you stable. The heel is softer and has more cushioning than previous versions. Designed specifically for over-pronators, the Brooks Addiction 13 is an incredibly cushy and stable trainer. 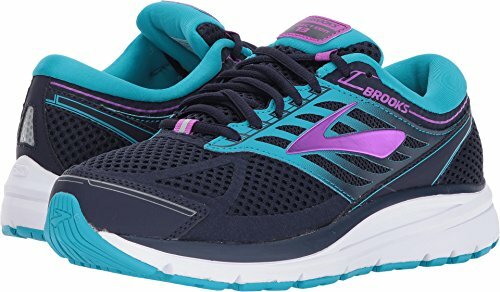 It has lots of Brooks’ BioMoGo DNA gel cushioning in the midsole to protect you from the jarring impact of running on concrete. The fluid gel responds to impact – the higher the impact, the more it will bounce back. This is essential when running on hard surfaces. The shoe absorbs the shock, not your joints. The Addiction’s breathable mesh upper ensures that the foot stays cool and dry, preventing friction. The interior lining has moisture-wicking technology and both the tongue and collar are cushioned to help prevent blisters. The Brooks Addiction 13 addresses over-pronation by adding their Extended Progressive Diagonal Rollbar to the shoe. This smooths out the ride and ensures the foot stays neutral when striking the ground. The thick rubber on the outsole not only protects you from impact, but also protects the shoe against abrasion. In the heel, there is a segmented crash pad, which gives the shoe added flexibility and smooths out landings. With its thick cushion of underfoot foam, the Gaviota is ideal for runners running on concrete. The Gaviota is supportive with solid stability while managing to be extremely soft at the same time. The upper is made from a lightweight, breathable material which keeps the foot cool and dry. The lining is also breathable and makes for a snug fit, while the mid-foot is held in place with extra layers (called Arch-Lock Wings) connected to the laces. The tongue and collar are cushioned and the heel has a pull-tab to aid with taking the shoe on and off and reduce wear on the heel. To prevent over-pronation, the Gaviota is equipped with the RMAT J-Frame, a J-shaped EVA and rubber frame that stabilizes the foot while running. The roll is aided by Late Stage Meta-Rocker Geometry – so the shoes rock a bit while running and walking. And an Ortholite foam insole keeps the underfoot cushioned. The outsole uses a High-Abrasion Lightweight Rubber, a durable material meant to improve traction while protecting the midsole from wear. The outsole is also marked with flex grooves, adding flexibility and smoothing out the ride. Altra’s line of Paradigm shoes is their most cushioned, ideal for protection against the harshness of running on concrete. For a shoe with this much cushioning, they’re also surprisingly light, at 10.3 oz. 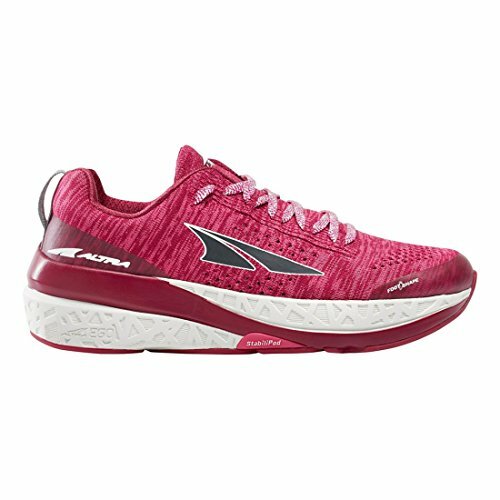 But like all Altra running shoes, the Paradigms feature a zero-drop design and a wide toe box to let your toes splay out naturally. Made of a light and breathable quick-dry mesh, the upper keeps runners’ feet comfortable. The foot-shaped design allows for extra room in the toe box. One potential issue is the shallowness of the upper, leaving a bit of the ankle exposed and somewhat less secure than other shoes. 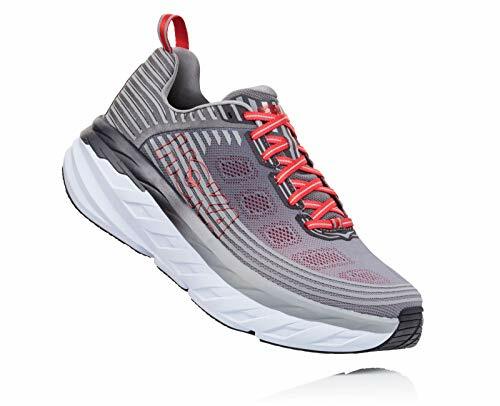 The signature feature of the Altra Paradigm is the 32mm of cushioning – quite a stack height, given the zero heel-to-toe drop. To combat over-pronation, Altra’s GuardRail technology provides extra support where the sole and upper meet, stabilizing your gait and making for a very smooth ride. With its comfortable underfoot cushioning, multiple shock absorption layers, and flexible design, the Echelon 6 is a cushy, responsive trainer ideal for running on concrete. The Echelon’s upper is made from Open Mesh, a lightweight fabric with pores that allow air in, keeping the foot cool. The heel area features a support frame which prevents instability and slippage. The Echelon also takes orthotics well, for runners with foot problems. Saucony’s Sauc-Fit system uses a series of overlays attached to the laces that help the upper conform to the wearer’s foot. Saucony’s SuperLite Foam runs the length of the shoe and is soft, responsive, and lightweight, which makes for a responsive ride. Atop this is the 3mm EVERUN topsole, which provides a durable springiness to the shoe. Finally, for even more cushioning, there is the 6mm removable polyurethane sock liner. The outsole uses a design called Tri-Flex for maximum flexibility, making sure the entire foot contacts the ground with each step. The heel features XT-900, which is a durable rubber that adds to traction and reduces wear and tear. The forefoot uses a soft rubber compound to improve the responsiveness during toe-off. 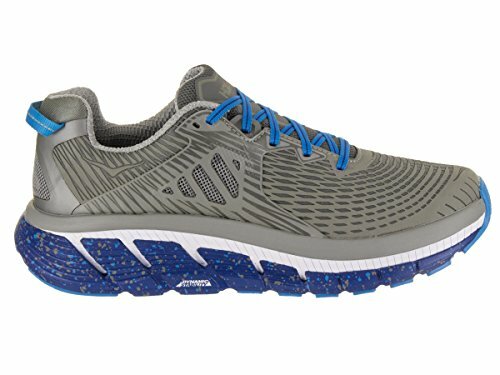 What should I look for when buying shoes to run on concrete? For a hard surface like concrete, you should look for running shoes that have lots of cushioning and good support. You want your feet to be protected from the impact of hitting the hard ground. 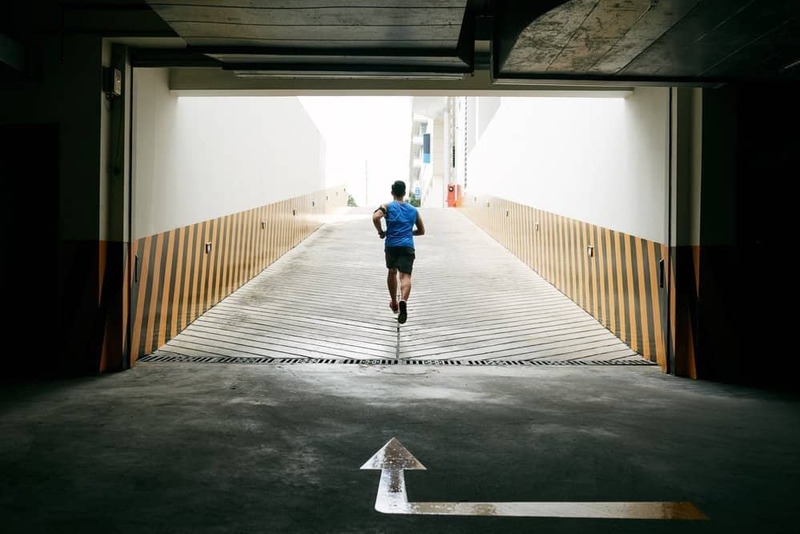 The more you run on concrete surfaces, the more susceptible you are to injury, as it is several times harder than asphalt. Therefore, it’s important to find shoes that are flexible, cushioned, and supportive to help absorb the shock. How can I avoid injury when running on concrete? Having good form and getting the right shoes to help with shock absorption will minimize the impact your feet and body experience pounding the hard surface of concrete. Experts also recommend varying the surfaces on which you run. Try to add in some trails, asphalt, and grass. Why does running on concrete hurt more than running on asphalt or a track? Quite simply, it’s a harder surface. If you want to contrast the hardness of concrete versus asphalt, take a hammer and hit both surfaces. Hitting the concrete will hurt more, and you won’t leave any sort of dent in the concrete while you will in the asphalt. Because concrete is a harder surface, it has that much less energy dissipation compared to asphalt, meaning that your shoes and body have to absorb more.